I received a package of items from We Choose Virtues for review. We got a pack of Virtue Flash Cards (ours was the NIV version but they come in NIV, Secular and KJV), A Parent Card - Family Character Assessment sheets - The Teacher Handbook, and The Butterfly Award for successful completion of the program. I really love this product. My boys are on the Autism Spectrum so any time we can make something visual and make it brief or even wordless - it is gold. They a little older than the age range on this product but it was easy to make it work for them. No worries! The publisher has a version for older kids - plus a Spanish version in the works - subscribe to their blog email list so you can get updates! An order from the site also gets you auto subscribed to updates as well. I had the boys fill out a Family Character Assessment. I had already decided we would start with the most important virtues: 1) Obedient, 2) Kind and 3) Helpful but I wanted to see their assessments bearing in mind that one of the deficits for people on the spectrum is point of view. The team was able to participate in a conference call with Heather McMillian and we found out the reasons she wrote this wonderful product and tips on implementing it. There are 13 Virtues to focus on and I was a little overwhelmed at where to start before the conference call. She advised we chose one Virtue to focus on per week but since my kids were older, we chose to focus on these three -plus another Virtue that specifically applied to each boy. When my boys are in a state of uproar, it helps a lot to simply show them a reminder than to tell them. Talking tends to escalate them when they are already headed for meltdown mode. The Flash Cards really help with this. Oldest's other Virtue to focus on was 'Self Control'. It is an area he struggles with quite a bit. He is the most spiritual of my three and he really appreciated this way of reminding himself to keep himself in check. If he started to get upset I would simply show him the card and it helped him focus and calm himself. Middle's other Virtue was 'Perseverant'. He chose that one for several reasons. He tends to be a perfectionist and if he doesn't do it perfectly the first time he will want to quit. The other reason was that as a part of The First Tee - a golf program for kids - he was assigned this core value to describe to the class one weekly meeting. (The First Tee program has 9 Core values). Youngest's other Virtue was 'Attentive'. That is his biggest challenge. Part of it is due to his ADHD and the other part is due to him being resistant to things he doesn't think he needs to learn. Again - having the card as a visual prompt helped him a great deal. The boys enjoyed the coloring pages. They like to do something - such as coloring - while they listen to their history lesson or during a read aloud and Bible time. They are very beautiful and I plan on hanging them in frames as reminders when they are done coloring them all. There are many products available for purchase. The Homeschool Kit is $98.99 but it contains so many things - including all of the Parent Cards, Posters and mini posters that I feel it's the best bargain. It has everything you need to complete the program. Also available is the Family Kit for $69.99. If you are on a strict budget, Heather suggested buying the Virtue Flash Cards - $14.99, The Kid's Virtue Poster - $15.00, and the Three Rules Poster -$6.00. To help with purchasing here are two coupon codes (codes CANNOT be combined). VIRTUE15 is good for 15% off of your order and it is a lifetime code that does not expire. HOME20 is good through March until the end of April 2013. I was also excited to see that they have a kit geared to Kid's Church. I know our church is always looking for something budget minded yet colorful and easily used for the kids in our congregation. I'll be bringing this product to their attention and we will be putting it to good use in our family for a very long time. I'll also be one of the first in line when the product for older kids comes out. To see what other members of the team had to say about this product click here. I received a copy of the FamilyMint workbook with online access for review. When I opened the book after it's arrival I was thrilled by the content. This is a very readable format - particularly for my boys who love money but hate reading. The book is constructed very visually. I was impressed and immediately registered for the online content. This too was very simple and straight forward. There is not an overwhelming amount of text or pictures on the pages - very balanced for my easily visually overloaded boys. Teaching the boys life skills is hugely important to me. I was taught none of these thing for a myraid of reasons. I was horrible with money when we first married and my husband had to handle our bills to prevent me from making a complete disaster of it. Fast forward 17 years later and I handle all the money - all the bills. I'm still not perfect at it but I no longer cringe when I open the checkbook or sign into our bank online. This product came at a perfect time for us. I had been looking for something to teach the boys how to handle money. The boys and I worked through the book. Oldest is almost 17 and has a part time job/apprenticeship. He needs to learn how to manage his money, plan and budget and his maturity level is at the point where he needs to train himself for delayed gratification. This review is based on his working through the program. He decided to save up for a racing wheel to go with his Playstation 3 and PC racing games. First I had him search out the exact one he wanted to find the price with shipping. 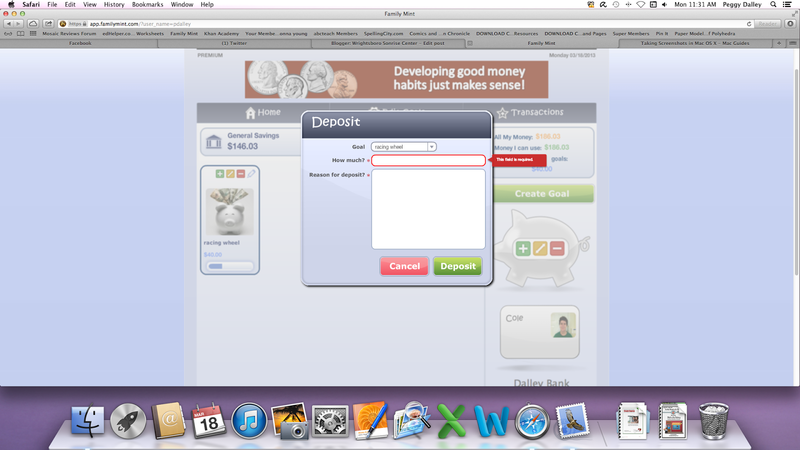 Then he entered the information into the Family Mint online banking website. It was easy for him to set up his goal and make a deposit. Sorry that my screen shots are not very clear - I'm new to all things Mac. From there he set up his own budgeting system. 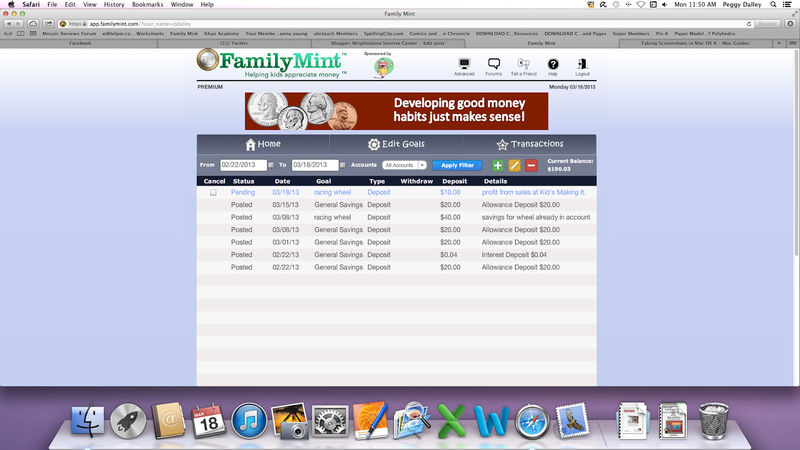 We were very glad that Family Mint Online had a version of the envelope system built in to their online site. This child loses everything and real envelopes are not something that would be practical for him. The practice worksheets really helped him learn how to fill out deposit slips and checks. He primarily uses the deposit slips and his Debit card if he needs money. However there are still checks he writes to his piano instructor and for Youth Group deposits and such. He wasn't as nervous about making a mistake after using the practice materials. It also helped him to use the Goal Tracking/Net Worth sheets because they resemble the check register. He is a very visual learner and this program really helped him understand how to be responsible with his money. Option #1 is an introductory special - for $29.99 you get the certification workbook and FamilyMint online premium access for life. Option #2 - Access to the premium online application subscription only for $24.99 annually or $4.95 per month. Option # 3 - Free access to the online application only. The above link will take you to the pricing options and what each one entails. It is a very good program and I will be using it with my other two boys. The creators of FamilyMint felt the way I did - that kids should know how to manage their money. Truly an ounce of prevention is worth a pound of cure when it comes to money management. If only I had something like this when I was a teen I could have avoided a lot of pitfalls in my financial life! This product is highly recommended by our family. To check out what others on the Mosaic Review Team reviewed please head over here.